Toronto and Region Conservation Authority (TRCA) just released The Living City Report Card for 2016. In collaboration with organizations across the Greater Toronto Area, the report card is a progress report on environmental sustainability in the Toronto Region. The report evaluates six key areas for sustainability: Carbon, Air Quality, Waste, Water, Land Use and Biodiversity, and includes a list of what is being done and what still needs to be done in each category. 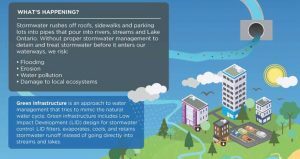 Green Infrastructure is highlighted in numerous sections, including as a key action for stormwater management. The first Living City Report card was published in 2011 and this report card shows the changes over time – for better or worse. Read the report here. We’ve heard of carbon trading, but what about nutrient trading? A report by the World Resources Institute looks at the idea of nutrient trading by municipal stormwater programs in Maryland and Virginia. In order to restore the Chesapeake bay, nutrient loads need to be reduced, however, the cost of reduction for municipalities is estimated to have a lower return on investment compared with the private sector (particularly agriculture). By allowing nutrient trading, municipalities could potentially save money while the agricultural industry could generate revenue. Is this a good idea? Read the full report here. In the face of increasingly devastating droughts and landslides in Peru, the city of Lima has begun developing a 30o-year Green Infrastructure Master Plan to help the area better manage stormwater. By 2020, there will be an estimated $30million dedicated to implementing this plan, with dedicated ongoing funding through water fees. Anticipated projects are likely to involve restoration of forests, grasslands and wetlands. Read more about this project here. 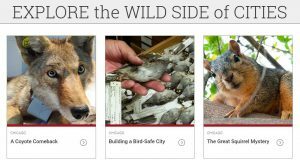 Chicago public broadcasters WTTW have started airing a show called “Urban Nature”, hosted by University of Chicago Assistant Professor Marcus Kronforst. The best part – you can watch full episodes online – even if you live in Canada! Must-watch episode for the green infrastructure enthusiast include “Rooftop Refuges”, “Oakland’s Redwood Forest”, and “The Streams Below our Streets.” Or watch them all.